The classic white XE503C12-K02US 11.6" Chromebook 2 Computer from Samsung is designed for a Web-optimized experience. With a simpler and more secure user interface than regular notebook computers, this Samsung Chromebook 2 features a fast and easy online experience. The 11.6" widescreen display is backlit with LED lights for low power consumption and high energy efficiency. The screen has a 16:9 aspect ratio and a 1366 x 768 native resolution, which can play 720p HD content without upscaling or letterboxing. The screen also has an antiglare finish so it can be used in brightly-lit environments. The Chromebook 2 can also output video to an external display via the HDMI port. Measuring just 0.66" thin and weighing in at 2.65 pounds, the compact design provides ultra portability without compromising functionality and optimal performance. It has a unique leather-like design for an added stylish finish. It can also boot up in less than 10 seconds and resumes instantly so you can load your favorite websites and social networks quickly and smoothly. The system is powered by a 1.9 GHz Samsung Exynos 5 Octa 5420 processor. It also has 4GB of DDR3L RAM, 16GB of eMMC flash storage, a MicroSD card reader, 802.11a/b/g/n/ac Wi-Fi (ac will be supported via a later software update), Bluetooth 4.0, a TPM security module, an integrated webcam, and microphone. There are also built-in stereo speakers. Google Chrome OS is a Linux-based operating system designed by Google to work exclusively with web applications. 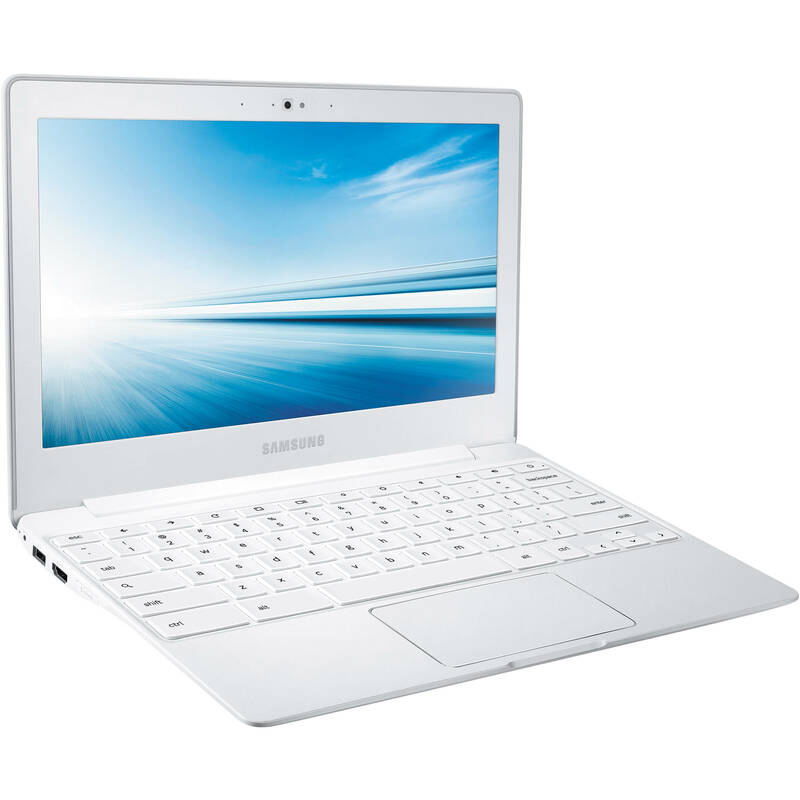 The Samsung Chromebook 2 combines the aspects of a pure cloud client with the hardware of a traditional portable computer, which puts it in its very own class of netbook and notebook computers. Powered by an eight-core 1.9 GHz Samsung Exynos 5 Octa 5420 processor, which is an ARM-based CPU, the Chromebook 2 allows for multitasking while the integrated ARM graphics help you get the most out of your favorite games and videos. You'll be able to keep pace with daily tasks such as email, Internet, homework, and managing household budgets. Run your favorite office and educational software and stay in touch with friends through social networks. The Chromebook 2 houses a 11.6" widescreen display, which is backlit with LED lights for low power consumption and high energy efficiency. The screen has a 16:9 aspect ratio and a 1336 x 768 native resolution. The resolution allows the Chromebook 2 to play back 720p HD content without upscaling or letterboxing. The screen also has an antiglare finish and a 200-nit brightness, which allows you to use the Chromebook 2 in brightly-lit environments. The Chromebook 2 supports 802.11ac Wi-Fi, which provides a high-speed connection to your home or office wireless network. Building on the foundation of 802.11n Wi-Fi, the 802.11ac Wi-Fi standard can provide higher data transfer speeds, greater coverage, and reduced latency than its predecessor. The Chromebook 2 is also backwards compatible with 802.11a/b/g/n Wi-Fi as well. There is also Bluetooth 4.0 technology for connecting to Bluetooth-compatible devices, such as a wireless mouse. Please note that 802.11ac Wi-Fi will be supported in a future software update. The Chromebook 2 is fast to use and doesn't slow down over time. It comes with built-in virus protection so you don't need to buy or install antivirus software. It can safely back up your files to the cloud. Please note that an Internet connection is required to get automatic updates. USB 3.0 can provide data transfer speeds of up to 5 Gbps, which is 10 times faster than USB 2.0. USB 3.0 is also backwards compatible with USB 2.0 as well so you can use your older USB-compatible devices. Measuring 0.66" thin and weighing just 2.65 pounds, the Chromebook 2 features a unique leather-like finish and sports a classic white color in a compact and stylish design. The Chromebook 2 boots up quickly as well as resumes instantly from where you left off, thanks to its 16GB eMMC flash storage. Box Dimensions (LxWxH) 14.488 x 13.071 x 2.362"
XE503C12-K02US 11.6" Chromebook 2 Computer (Classic White, Wi-Fi Only) is rated 5.0 out of 5 by 4. Rated 5 out of 5 by Reinaldo from The Best of The BEST! I've used a Chromebook before and liked it - that is until I tried this one (Samsung Chromebook 2). This little thing is a beast compared to all others! I love it! Works flawlessly - SMOOTH! So smooth, it hard to believe I'm even working with a Chromebook. It has massive power (an Octa-Core processor) and can do a lot more things than the previous model as far as working seamlessly with android phones & tablets! I absolutely LOVE this Chromebook! Get's the job done! It worth every dollar. Looks beautiful (I have the white model) - it's the best investment I've made thus far in a computer! Rated 5 out of 5 by Anonymous from Comfortable and easy to use It turns on and off very quickly. It is very useful to have around the house and make inquiries online, check email, view photos or videos. I did an excellent purchase. My mom uses it all the time and did not need too much training. Rated 5 out of 5 by South Nguyen from My daughter very very like it Super fast Chromebook for college student. Buy one don't hesitate, I'm sure you will love it. Rated 5 out of 5 by Roston from AWESOME Laptop Overall a great computer. Light, long battery, and surprisingly powerful. 1. Can I connect to a printer?2. Can I view Microsoft office documents? You can not directly connect to a printer. However, if you have a wireless printer on your network then it works fine. does it have a dvd import?